Oil palm monocultures have expanded rapidly in Myanmar over the last decades. 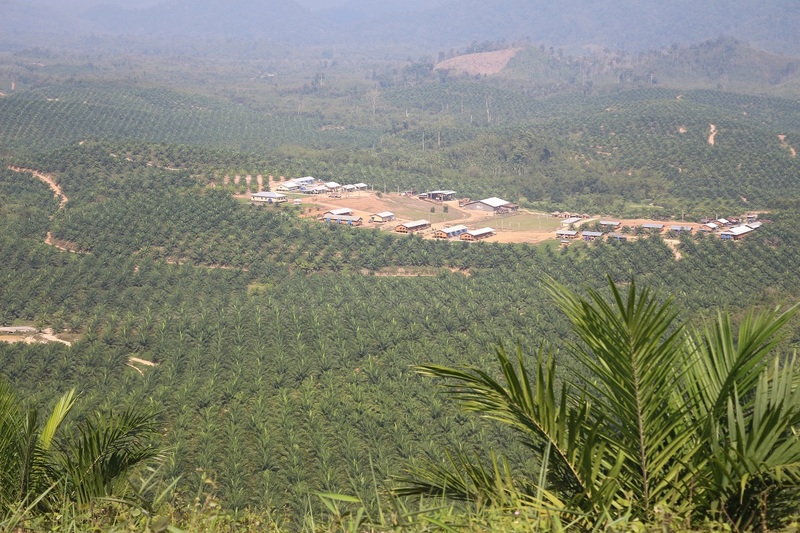 In Tanintharyi region, more than 1.8 million acres (728,434 ha) of land have been awarded for oil palm plantations, often to companies with close ties to the military. Expansion has further increased recently through the arrival of foreign direct investment into the country. This expansion has provoked large human rights abuses and environmental destruction, as the case of the Myanmar Stark Prestige Plantation (MSPP) Oil Palm concessions shows [1,2,3]. The development and impacts of the MSPP concession have been documented in detail through the Green Desert report (see ), produced by local civil society organizations. MSPP was granted a permit by the Myanmar Investment Commission (MIC) to establish a 38,000 acres (15,378 ha) oil palm project in the year 2011. The project is in an area marked by more than six decades of civil war between the central government and the Karen National Union (KNU). The preliminary ceasefire agreement, signed by both parties in 2012, brought an end to the massive human rights violation caused during the civil war. However, it also opened former war zones with weak land tenure to foreign direct investments, which have caused new negative impacts for communities and the environment. Located in an area under mixed administration of both the Myanmar government and the KNU, villagers are even more vulnerable to the concession development, as the two governments shift the blame and responsibilities among them . The concession was granted in a non-transparent way and has caused large social and environmental impacts. The concession development did not comply with domestic law or with international human rights principles. No free prior informed consent (FPIC) with affected communities was obtained and the area was incorrectly classified by the central government as ‘vacant land’. This has led to severe conflicts over encroachment of indigenous customary land - the project area overlaps with agricultural and community land of four villages, home to approx. 4,480 people. Since 2011, about 6,000 acres (2,428 ha) were cleared by the company, including betel-nut and cashew orchards belonging to villagers. Loss of productive land has resulted in livelihood loss and increased debt levels as many villagers have been unable to meet their basic needs. Some were forced to become day laborers for low wages . Money offered by the company to compensate damages was too little and many villagers refused the compensation [1,3]. Fertilizer and pesticides use have moreover caused water pollution. While some wells were constructed by the company to deal with the declining availability of clean water sources, some of the wells were soon polluted by animal feces due to poor design. Consequently, villagers reported livestock dying, skin irritations and dysentery. Furthermore, the company has been involved in aggressive timber logging, leading to deforestation and clear cutting of natural forests. To establish the plantation, high value timber stocks were first logged and retrieved from the area. Remaining vegetation was then burnt to establish the palm oil cultivation. The affected communities organized themselves, held large meetings and protested in many ways to show that they did not accept their land being taken. Religious prayer ceremonies were held. Several complaints were filed to the company, to KNU officers, to the regional government and to the central government, including State Counsellor Daw Aung San Suu Kyi. However, no meaningful responses followed. In February 2015, affected communities invited media groups to share their case and also met with lawyers to discuss their legal options. Villagers furthermore started to document in a detailed way their losses caused by the company. In March 2015, the KNU Mergui – Tavoy district issued an order to halt operations; however, the company continued operations. 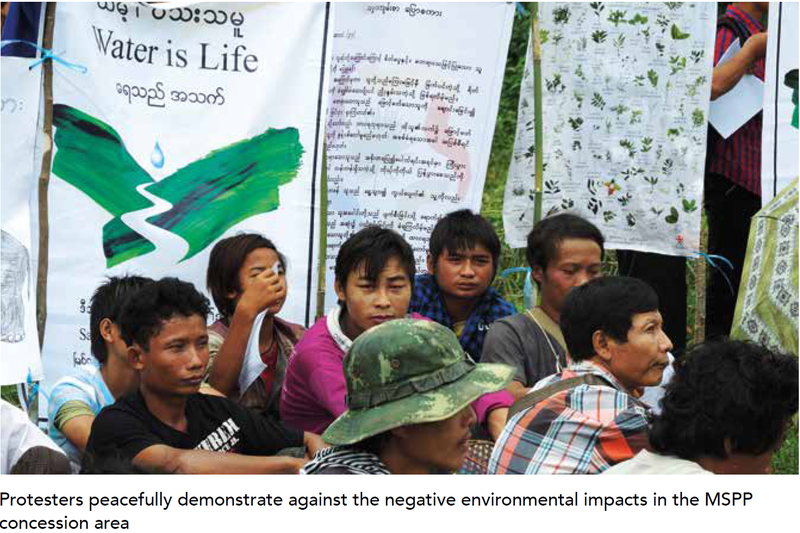 In April 2016, affected communities submitted complaints over the MSPP plantation to the Tanintharyi Joint Meeting Committee (JMC), responsible for monitoring complaints in the area. Following a subsequent meeting in July 2016, the Tanintharyi Township Police office sent a letter to MSPP, requesting to suspend operations temporarily. The company stopped further expansion. The suspension was a great achievement and offered an important opportunity to seek solutions in the MSPP land conflict. 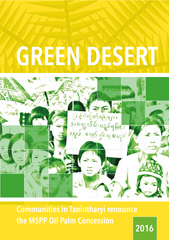 In December 2017, the Green Desert report (see ) was released through a collaboration of 12 civil society organizations. Based on 18 months of field work, the report detailed many of the concerns associated with the plantation. It was presented to the central government and received large media coverage. 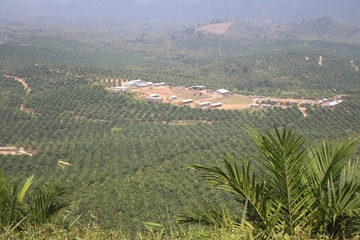 As of early 2018, further expansion of the oil palm plantation has been limited by the authorities, however the remaining concession land has not been returned to the communities. Concerns over forest clearance and timber logging continue despite of the suspension. Negotiations between the communities, the company and the government are ongoing. Project Details The Myanmar Stark Prestige Plantation (MSPP) project is located in Tanintharyi Township, Myeik District. The Karen National Union (KNU) administers this area as Ler Muh Lah Township, Mergui-Tavoy District. Four villages are located within the concession area: Thein Pyin, Kawat, Baw Sa Nway, and Swae Chaung Wa . The MSPP project is a joint venture between Malaysia-based Prestige Platform (95%) and the Myanmar-based Stark Industries (5%). According to the Green Desert Report, the Prestige Platform is a subsidiary of Glenealy Plantations, which is owned by Samling Group. Stark Industries was founded by Mya Thida Sway Tin, a businesswoman with connections to military and business elites. The investment size is reported to amount to 36.75 million USD . The MSPP project is financed by Maybank, Malaysia that issued 124 million USD in bonds to Glenealy Plantations. Maybank itself is financed by several international funds and entities, such as the Norwegian Pension Fund, the Japan Bank of Cooperation and Development (JBIC), and others. The 30-year permit granted by the Myanmar Investment Commission in 2011 amounts to 38,000 acres (15,378 ha). However, the project signboard, erected in 2014, lists the concession area with 42,200 acres (17,077ha), while a company map (2015) shows an area of 49,227 acres (19,921 ha) . 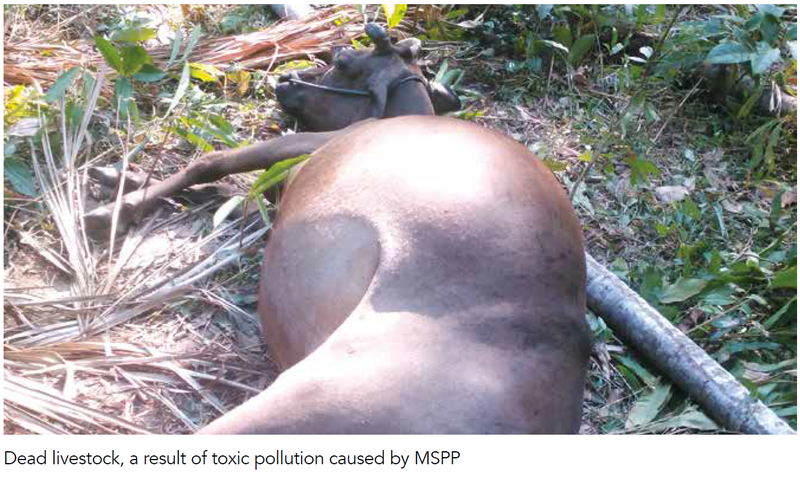 Other Water pollution through fertilizers, pesticides and animal faeces caused livestock dying, skin irritations and dysentery. Development of Alternatives Groups argue for a moratorium of oil palm plantations until functioning safeguards are in place to protect both communities and the environment. More generally groups call for a moratorium on large-scale investment projects in conflict areas until strong and inclusive governance mechanisms are in place. For further recommendations, see the Green Desert report, published in December 2016 . Why? Explain briefly. The social mobilizations had significant impact on raising awareness about oil palm expansion in the region. The expansion of the project has been temporarily suspended, however, the concession area was not returned to the villagers. 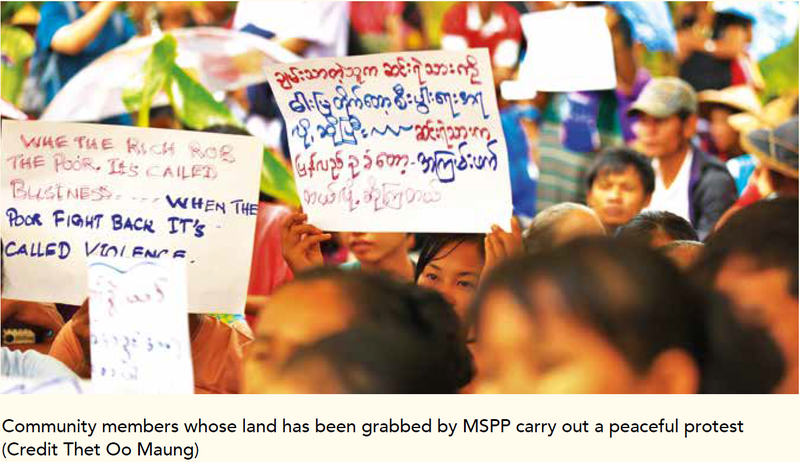 GREEN Desert: Communities in Tanintharyi renounce the MSPP Oil Palm Concession. Report published in December 2016, by Tarkapaw, TRIP NET, Southern Youth, Candle Light, Khaing Myae Thitsar, Myeik Lawyer Network and Dawei Development Association. (accessed online 14.04.2018). Mighty Earth, 3 February 2017. Samling’s Forest Crime Spree Moves to Myanmar. (accessed online 14 April 2018). Eleven Myanmar online news, 13 May 2016. Tanintharyi villagers demand end to palm-oil project. (accessed online 14.04.2018).